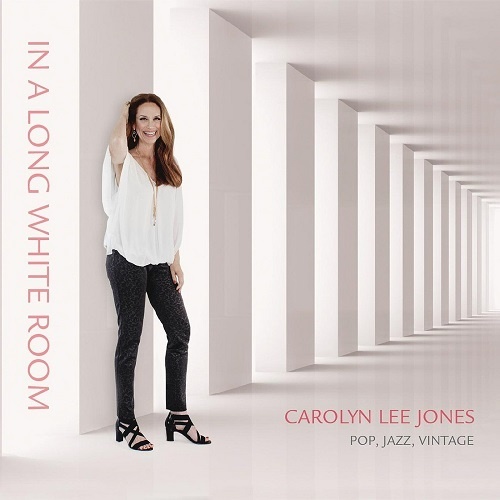 Vocalist Carolyn Lee Jones offers a sophisticated take on classic pop tunes on her latest offering In a Long White Room, brimming with classic songs like “Moondance,” which is give a Latin treatment that shimmers with elegance and an easy-going brilliance. Or the Muldaur hit “Midnight at the Oasis,” which is given a respectful take close to the original, yet with Jones’ bubbly lilt that furthers the tunes accessibility for the listener. Jones likens her music to classic vintage pop, jazz flavored arrangements of 60’s and 70’s hits, freshened with swing rhythms, straight- ahead jazz and Latin grooves, soulful and sultry ballads, with a touch of R&B. That well articulates the meaning with no argument from me. But to further that point, it is Jones’ voice and her matter of fact delivery that eases the listener into what is best about pop-jazz. Not driven by pyrotechnic vocal approaches, Jones offers the listener a soothing experience, like talking with an old friend that you hang on their every word and looking forward to listening to. Jones invites the listener to sit back and enjoy. The title track “In A Long White Room, made famous by Nancy Wilson is approached like the original arrangement intended it to be. Jones’ voice is full and convincing, her sunny singing conveys the lyrics with believability and buoyancy, you can hear the smile in her voice coming through. Her backing musicians caringly support her, not stepping or overpowering her gentle vocal approach, which allows Jones to shine and the listener to savor the beauty she has to offer. A twenty-seven second reprise is also available at the end of the album to enjoy. Is this a hard-core jazz album, certainly not – but, I don’t feel Jones ever intended it to be. Though the 60s and 70s were a time filled with protests and raging against the man, there were entire sectors of the music industry that were pumping out sunny hits that were meant to create a bit of escapism in daily life. Jones has reflected those tunes in her selections on her jazz-pop offering. Her voice is well-suited for this material, and certainly will also appeal to adult-contemporary listeners alike. Jones has successfully created a laidback listen that is simply meant to be light and enjoyable.